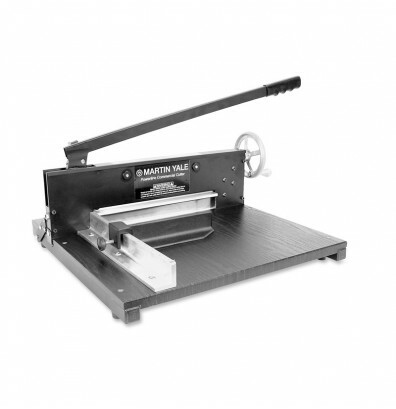 Martin Yale 7000E 12" stack paper cutter delivers straight, clean cuts using a steel blade. Its 12" cutting length is more than enough for standard, letter size paper. Martin Yale 7000E 12" cutting length, professional-quality stack paper cutter delivers straight, clean cuts using a steel blade. Its 12" cutting length is more than enough for standard, letter-size paper stacks and reams. Ideal for medium-capacity paper cutting projects such as brochures or flyers, and works well in school, print shop and office mailroom environments. Martin Yale 7000E paper cutter features a positive clamp that holds a stack of paper in place to avoid shifting and tearing. Able to cut 350 sheets of 20 lb. bond paper at once to save time on trimming. Quick crank handle adjusts paper clamp and presses paper firmly into place. Adjustable back gauge increases cutting accuracy. Tall paper side rail squares stacks and simplifies cutting jobs. The 7000E commercial-grade stack paper cutter offers a safety blade latch that prevents cutting until released for added safety. Heavy-duty wood base for long-lasting use. Non-skid feet maintain stability while protecting table surface. Replacement blade available, see Martin Yale model# WRA007007. Paper guide locks onto calibrated measuring rule (Imperial/USA and metric scales). Positive clamp holds paper in place to avoid shifting and tearing. Quick crank handle makes clamping faster. Adjustable back gauge increases cutting accuracy. Non-skid rubber feet protect table surface from scuffs and reduces slipping. Tall paper side rail squares stacks to simplify cutting jobs. Blade and other parts may be serviced, replaced, and resharpened for long-lasting use. The bwst in quality, though peicy. Easy to use, safe and professional for light office use.